"It is absolutely beautiful and is exactly what I was looking for. 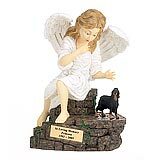 Thank you again and I will let anyone that asks know how pretty your product is and how quickly you ship your orders out." 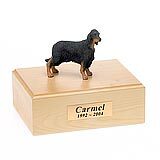 All available Gordon Setter dog urns and memorials will be displayed with the figurine on the Gordon Setter urn you select and in the appropriate size.